A former regional reporter has released a book documenting his time on the election campaign trail with UKIP. Owen Bennett has penned Following Farage: On the Trail of the People’s Army, which is described as “the ultimate political road trip”. Owen, who began his career at the Colchester Gazette, has chronicled his time covering the party in his capacity as political reporter for both the Daily Express and the Daily Mirror. He now holds the same position at The Huffington Post UK. In an interview with the Gazette, Owen said: “Douglas Carswell’s defection to UKIP was what inspired me to write the book. “Even though I could see the party growing, it was Carswell’s defection which made all of us working in Westminster realise this party was now a serious player. “I had known Douglas since working for the Gazette, so while everyone else was wondering what Clacton, Frinton and the rest of the constituency was like, I could relax a little bit, since I already knew. “Coming back to Clacton after two years away was great, and the town was clearly loving the spotlight. “It felt more like an American mayoral election than a British by-election. 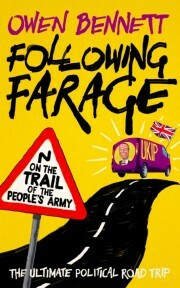 Following Farage: On the Trail of the People’s Army is available now from Biteback Publishing. Glad to see Ralph Steadman and I are still inspiring cover designers.